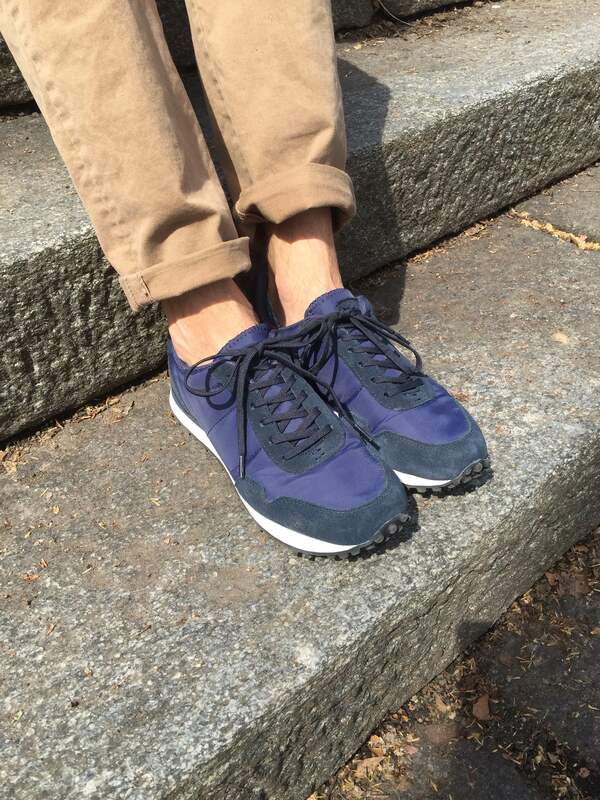 April 20, 2015 May 18, 2015 by Beau H.
The GREATS Rosen Runner — a perfect casual sneaker for high-low wear. Short-sleeve mini-check shirt by H&M. Khaki chinos by Frank & Oak. Silver dive watch by Invicta. Glasses by Warby Parker. In recent years, as high-low dressing has exploded and really gained more traction — think much more stylish iterations of the everday blazer-and-jeans combo, to start — sneaker options for guys have also really exploded as well. While there have always been classic options like Converse Jack Purcells, certain sneaker silhouettes have definitely swung back in style — especially the runner-style sneaker (see Exhibit A here). 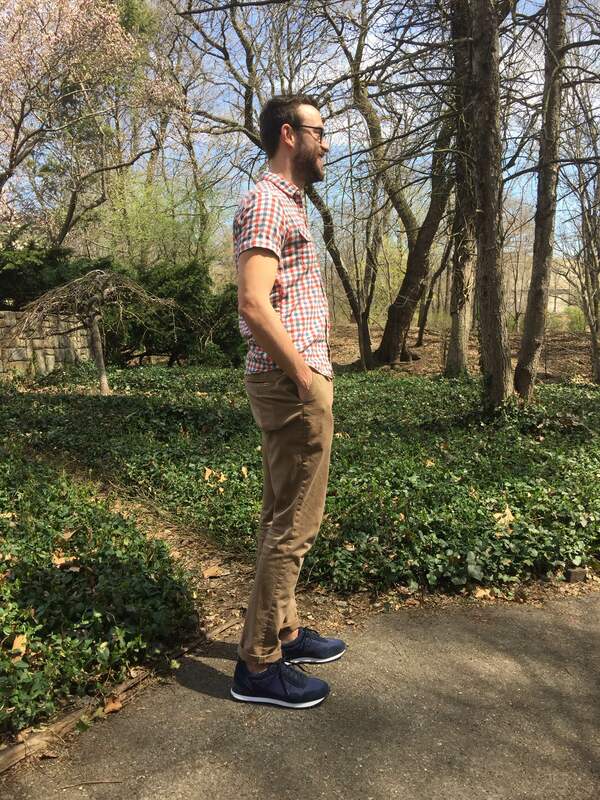 These types of sneakers mesh perfectly with everything from joggers (yes, joggers can work when worn casually) and a tee to chinos and a buttondown (asyou can see here). One of the more recent sneaker offerings from GREATS out of Brooklyn is cut from that same versatile cloth. 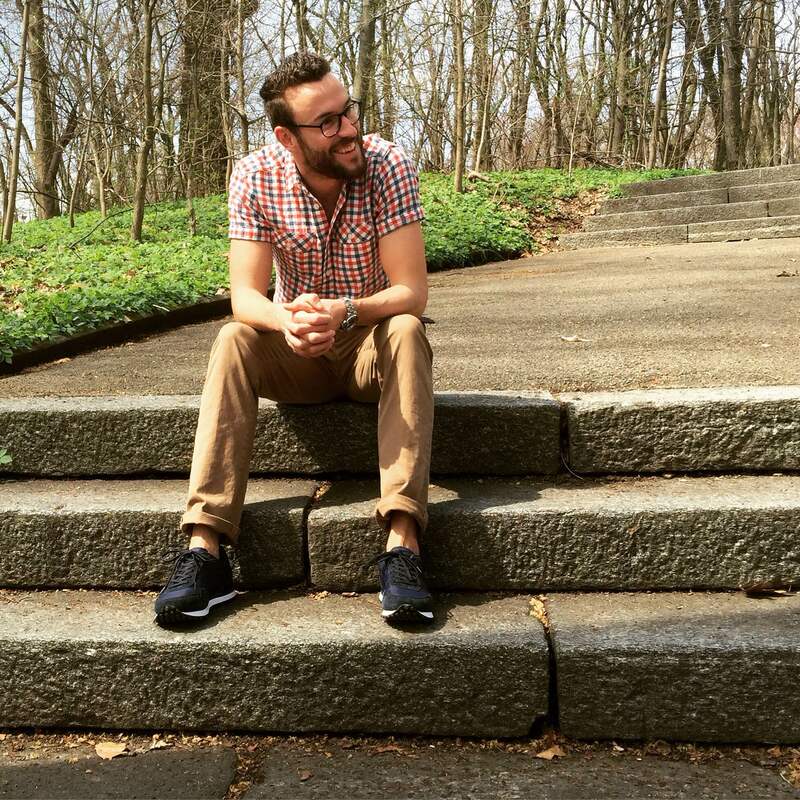 Getting out and about in Brooklyn with a versatile, casual shoe. Photo credit: Liz Tod. GREATS has been featured on this site a few times already, but the quality of the last pair of sneakers I picked up was simply too good to pass up the chance at another pair. 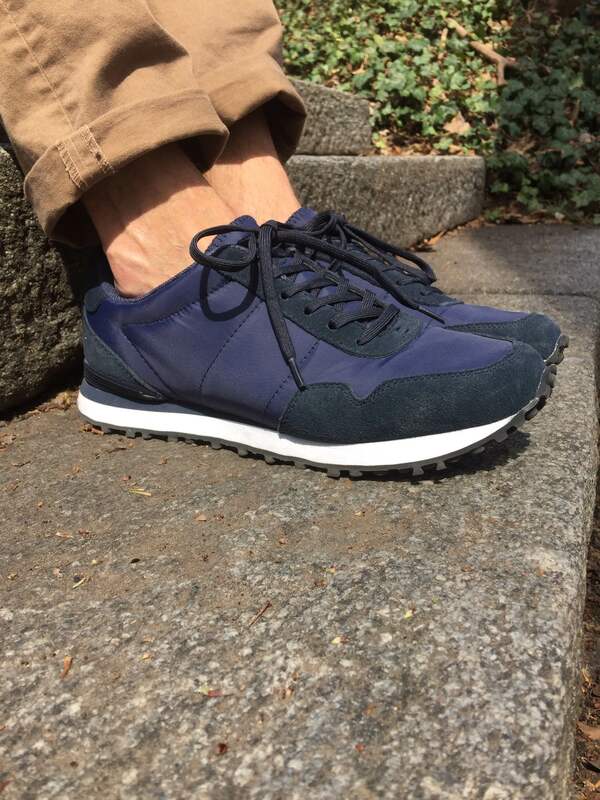 The Rosen Runner dropped in about mid-February to rather mixed reviews (if you follow Hypebeast comments, that is) but I snagged my pair in Cadet (a nice navy color) about a month back from the brand’s small Field House shop near Williamsburg in Brooklyn. The sneaker takes its styling cues from classic American runners and tips its cap to legendary track coach Al Rosen, born in Brooklyn himself. It’s also available in a nice deep Olive and a cream Nimbus color, but navy was my pick. The combination of nylon and suede is surprisingly durable. Khaki chinos by Frank & Oak. The sneaker brings to mind other kicks with the same silhouette, namely virtually any one of the pairs in the New Balance for J. Crew collaboration, although the shape of this shoe seems a bit trimmer. Design inspiration aside, these shoes look great, fit extremely well and provide tons of comfort — perhaps even moreso than the previous pair of GREATS sneakers in my closet. That comfort proved necessary during a long walk through Brooklyn’s Prospect Park and an evening spent exploring Park Slope on foot, too. More importantly, they’ve paired perfectly on a few different outings with the khaki chinos seen here, as well as a Rust V-neck tee (from my pals at Pistol Lake) and a denim jacket for a casual lunch. These sneakers would work just fine with longer, patterned socks, but no-show socks fit just fine. As far as comfort, these shoes feel springy and surprisingly durable to move around in. The Vibram outsole and EVA midsole provide a very nice amount of cushion — this definitely doesn’t wear like a normal pair of canvas sneakers. While they could also be worn with longer patterned socks (like with this look), they were comfortable with some no-show socks, too. The bottom tread isn’t just for looks, as it’s grippy and adds to that springy feeling. And while I was initially wary of the combination of suede and nylon, the nylon stood up to a slight ice cream spill (the horror!) and cleaned up just fine, while the suede portions of the shoe have good color and a decent (not necessarily cheap) feel. Subtle branding on the back heel. The minimalism of these shoes and the lack of a logo on the side (in contrast to their New Balance counterparts) is a definite benefit — I’ve found them to be highly versatile because of that. 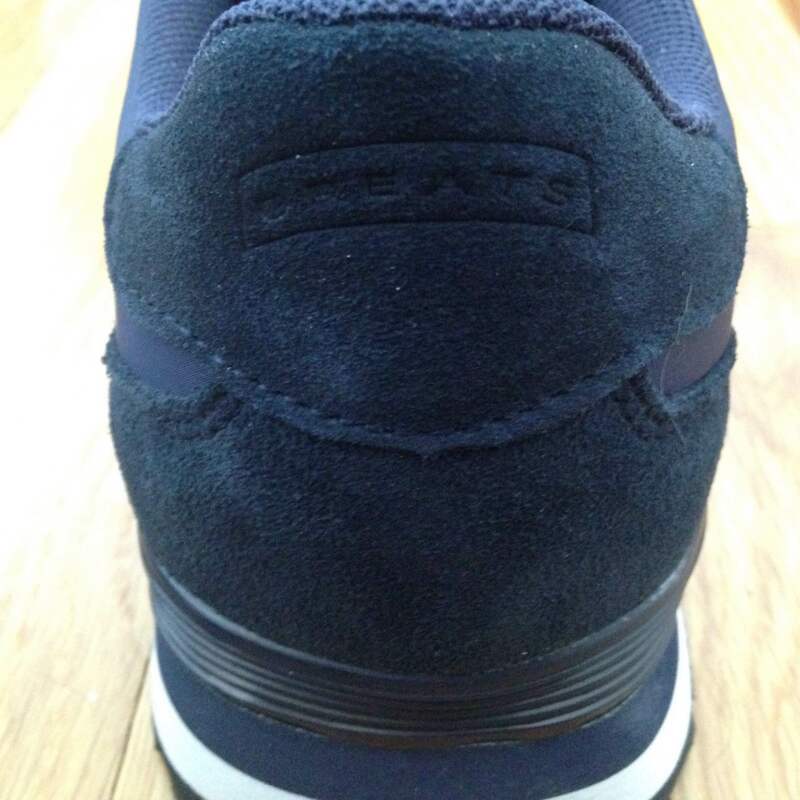 There’s only a very small “G” emblazoned on the suede top of the tongue, and a lightly stamped “GREATS” arch logo across the suede on the back heel. While it’ll be interesting to see how the suede holds up with repeated wear, I’m not worried about the durability of the nylon or the construction of these shoes — they certainly don’t feel like a pair of sneakers you can pick up for less than $50. For the price, they’re an outstanding deal — maybe the best on the market right now. What’s your experience been like with GREATS? How would you style this particular pair? I tried to get your size chart but could not fit some reason. Can you send me the size chart?